From San Jose: Take Hwy 17 to Santa Cruz. Exit at Mt. Hermon Rd in Scotts Valley. Drive 3.6 miles to Graham Hill Rd and turn left. Drive 0.6 miles. Roaring Camp will be on the right. From San Francisco: Take I-280 South to Hwy 17 to Santa Cruz. Exit at Mt. Hermon Rd in Scotts Valley. Drive 3.6 miles to Graham Hill Rd and turn left. Drive 0.6 miles. Roaring Camp will be on the right. From Monterey: Take Hwy 1 North to Santa Cruz. Exit at Hwy 17 North to Scotts Valley. Drive 3.6 miles to Graham Hill Rd and turn left. Drive 0.6 miles. 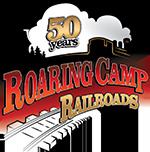 Roaring Camp will be on the right.